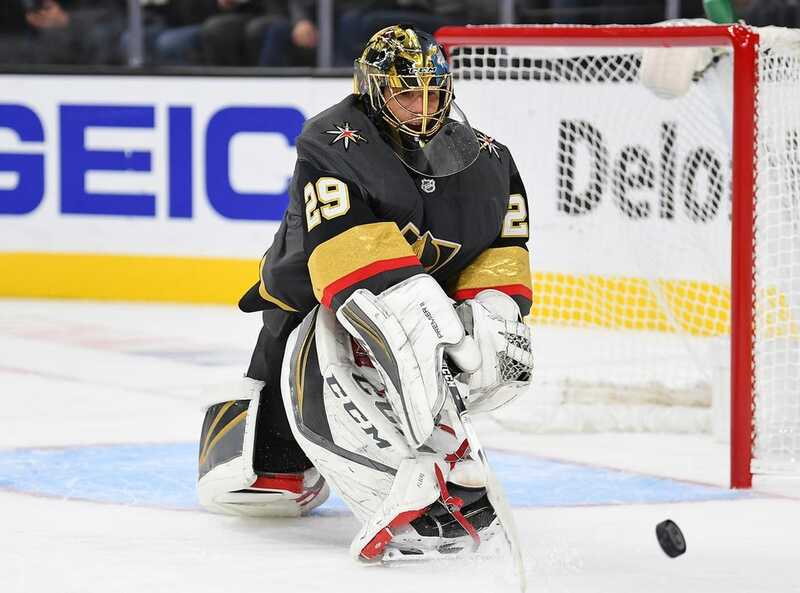 Jonathan Marchessault scored two goals, and Marc-Andre Fleury had 26 saves for his 407th career win to lead the Vegas Golden Knights to a 4-1 victory over the Buffalo Sabres on Tuesday night in Las Vegas. Fleury moved into a tie for 10th place with Glenn Hall on the all-time wins list for NHL goalies. William Karlsson had a goal and two assists, and Cody Eakin also scored for Vegas, which scored more than two goals in a game for the first time this season. Reilly Smith added two assists. Vladimir Sobotka scored for Buffalo, which was playing the second game of five-game western road trip that began with a 3-0 shutout of the Arizona Coyotes on Saturday and continues on Thursday at San Jose. Carter Hutton stopped 25 shots for the Sabres. Vegas, which had a Shea Theodore goal midway through the first period overturned by a coaches' challenge after it was determined Max Pacioretty was offside prior to the goal, bounced back to take a 1-0 lead on a power-play goal by Marchessault. The Golden Knights center converted a centering pass from Karlsson from the slot, firing a shot under Hutton's arm with 1:01 left in the period. Marchessault's third goal of the season snapped Vegas' 0-for-16 streak on the power play to open the season, and left the Los Angeles Kings as the only team in the NHL without a power-play goal this season. Eakin made it 2-0 early in the second period with an unassisted short-handed goal, breaking out in an odd-man rush with Ryan Carpenter and then beating Hutton on his blocker side with a left-handed wrist shot from the right circle. It was the third goal in just four games for Eakin, who began the season on injured reserve with a lower-body injury. Karlsson, who finished third in the NHL with 43 goals last season, scored his first goal of the season at the 10:40 mark of the third period, redirecting a crossing pass from Smith past Hutton. The Sabres pulled Hutton with 4:43 remaining and had a six-on-four advantage when Vegas defenseman Colin Miller went to the box for a tripping penalty with 2:40 left. Sobotka backhanded a shot from the slot through Fleury's pads with 36.7 seconds left to spoil the shutout bid. Marchessault then added an empty-net goal with 12.7 seconds to go to finish the scoring. Karlsson earned an assist, his second of the game.